NOTE: On the last day of May 2000 I received the following e-mail from Pat McKnight, Historian with Steamtown National Historic Site. Within a week I received the draft copy of the report that he mentions in the e-mail. The version reprinted here has had the images and endnotes removed in the interest of brevity. Readers are encouraged to contact Mr. McKnight with additional information on the 129 and/or requests for copies of the complete draft report. Many thanks on your past input on Rutland car information. I currently have my report on the #129 baggage car in draft format and am sending you all a copy through the regular mail. Feel free to review it, tear it to pieces, suggest additions or deletions as you see fit or give no input at all (or leave it where your 4-year old can get ahold of it and make his edits like mine did). I do not see any work being done on the car in our Restoration Shop until 2001 (there is a pretty big backlog of jobs now). Since work is not pending, I hope my report gets reviewed by any interested party and is as close to perfect as a paper on this subject can be. If you know of anyone else who might be interested in reviewing the paper, I'd be happy to send out additional copies. Please note the report is currently in draft and due to the nature of the report, it follows a format that may not flow as well as one might like. This is not a Historic Structure Report which would be done for a complete restoration, but for interim stabilization, or as we like to call "paint and park." Though our "paint and park" is close to what some people call restoration. I look forward to any input on the subject and that the #129 is preserved. PURPOSE OF REPORT: This Cosmetic Painting and Stabilization Documentation provides information to preserve the Rutland Railroad Baggage-Express Car #129 in the National Park Service (NPS) collection, Steamtown National Historic Site (NHS). This report is focused on guidance for painting and lettering this piece of equipment. It is a brief historical study, researching the ownership and revenue service history of the rolling stock for the purpose of determining historically correct colors and markings. This report documents the structure's appearance for its home railroad(s) during particular periods of steam revenue service and recommends appropriate colors and markings. It includes reproductions of photographs, diagrams and supporting documents. The report documents sources in the text and in endnotes. This report does not replace a Historic Structure Report (HSR), nor are there any mechanical recommendations to make the car roadworthy. An HSR should be completed for full restoration, especially if plans are made to return it to service on an active railroad train. HISTORICAL PERIOD: In reviewing the history of the #129, the period when the Rutland Railroad owned and operated the car would be best for cosmetic restoration. The period is from the baggage car's construction in 1914 and its operation by the Rutland Railroad (whose corporate existence can be traced back to 1843), and its successor, the Rutland Railway (1950-1963). Hereafter, when referring to the Rutland Railroad or Rutland Railway, it will be called "the Rutland." The first twenty years in operation for the Rutland, from 1914 to the mid-1930s, when the #129's livery was Pullman Green with gold lettering is most appropriate for cosmetic restoration. When the car was sandblasted and repainted in the mid-1930s, a new era was begun. While the 1930s paint scheme was similar, this paint scheme may have overlapped diesel operations. The Rutland stopped using steam locomotives for motive power in 1953. This corresponds with the cessation of passenger service the same year. The #129 had a short period of railroad express service from 1953 to 1960. Its conversion into a Maintenance of Way Tool Car during the final years of the railroad's existence is not appropriate for restoration either since neither use reflects the original function of the car and overlaps the diesel period. The brief period of time the Green Mountain Railroad Corporation (GMRC) had the car in the mid-60s is not appropriate for restoration. The period that it resided as a museum piece for Steamtown USA and Steamtown NHS, from 1969 to present, is not applicable for cosmetic restoration purposes. It was on the Rutland's tracks that the #129 spent its functional life as a baggage car. This time period ran from 1914 to 1963. The last documented 'run' of the #129 as a baggage car in conjunction with passenger service was in 1953. Express service ceased in 1960. The early Rutland period, 1914 to the mid-1930s, is most significant for interpretation as a car used in conjunction with steam locomotives. This period also marked the high point of the Rutland Railroad. The color and appearance of the car in this period is well documented. PAINT SCHEMES & MARKINGS: The #129 is a baggage car that followed the basic New York Central (NYC) Plan G-74. Many railroads, especially those influenced by the NYC, like the Rutland, used these plans. The initial painting of the car at the American Car & Foundry (ACF) Company plant was standard Pullman Green with gold lettering following NYC standards. The undercarriage was painted black. The canvas roof was also black, stained with black linseed oil. This appearance followed the car from its construction until the 1930s when the Rutland modified the lettering scheme for most of its cars. Analysis of existing paint should be made in conjunction with the Restoration Shop, documenting the different colors that appear on the car. A similar analysis of historic photographs for exact placement and style of markings will also need to be made. RECOMMENDATION: The #129 is suffering from prolonged exposure to the elements. Unless basic stabilization steps are taken, it will undoubtedly deteriorate beyond repair. Remove all bad paint and rust. Replace rotted wood before repainting. Repair or replace any broken doors, windows and trim. Replace in kind metal that is rusted. Depending on practicality, remove existing paint. Ensure integrity of the roof. Currently there are a number of layers of paint on the piece, even though it was sandblasted in the mid-1930s. If found, carefully document the remains of the markings as to placement, content, and style. The interior of the baggage car is currently filled with miscellaneous equipment and seats. To better assess the condition of the car, as well as monitoring its integrity, the objects currently stored should be permanently removed. If the equipment is part of the original car, an exception should be made. For exterior cosmetic restoration purposes, unless active deterioration is taking place, the interior should be empty and clean. CORPORATE LINEAGE: ACF built the #129 in its Berwick, PA shops in October of 1914. ACF was created through the merger of thirteen independent railroad car manufacturers in 1899. These companies were the Buffalo Car Manufacturing Company of Buffalo, NY; the Ensign Car Manufacturing Company of Huntington, WV; the Jackson and Woodin Car Company of Berwick, PA; the Michigan Peninsular Car Company of Detroit, MI; the Missouri Car and Foundry Company of St. Louis, MO; the Murray, Dougal and Company of Milton, PA; the Niagara Car Wheel Company Buffalo, NY; the Ohio Falls Car Company of Jeffersonville, IN; Pennock Brothers of Minerva, OH; the St. Charles Car Company of St. Charles, MO; the Terre Haute Car and Manufacturing Company of Terre Haute, IN; the Union Car Company of Depew, NY; and the Wells and French Company of Chicago, IL. After the initial merger, three additional car-manufacturing companies were acquired between 1901 and 1910. These companies were the Indianapolis Car Company of Indianapolis, IN; the Bloomsburg Car Manufacturing Company of Bloomsburg, PA; and the Jackson & Sharp Company of Wilmington, DE. The ACF plant in Berwick was originally the Jackson and Woodin (J&W) Car Company. The company started in 1861 as a plow manufacturer. By the end of the decade J&W was building mine cars and freight cars. The Berwick plant was one of the largest railroad car manufacturers in the country by 1880. William H. Woodin, president of J&W and grandson of the company's founder, became president of ACF in 1916 and was later president of the American Locomotive Company. ACF built its first steel-body passenger cars between 1901 and 1905 at the old J&W plant in Berwick. In 1907, ACF participated in the first mass production of all-steel passenger coaches in the United States. By 1912, ACF had fully shifted its passenger car production from wood to steel. All steel construction also saw its way into baggage cars. When the Rutland ordered three new baggage cars in 1914, it is of no surprise they were of all steel construction. ACF continued to produce freight and passenger cars at its Berwick facilities for nearly another fifty years. On June 1, 1954, American Car and Foundry changed its name to ACF Industries, Inc., as part of its diversification from the railroad car building industry. Finally, the plant closed in October of 1962. The Berwick Industrial Development Association, with the intent of creating an industrial park, acquired the massive Berwick facility. The industrial park currently serves a wide number of clients today. The corporate history of the Rutland Railroad can be traced back to the incorporation of the Champlain and Connecticut River Rail Road Company on November 1, 1843. Like many of the early railroads, it went through numerous acquisitions and mergers. The actual Rutland Railroad was created on July 9, 1867, when the Rutland and Burlington Railroad came out of receivership, and operated until 1950 when it reorganized to become the Rutland Railway. The Rutland Railroad, even though it had its own name, was not immune to influences of other railroads. The railroad went through a number of ups and downs for the remainder of the nineteenth century. By the turn of the century, traffic increased as the Rutland reached new markets. The completion of the lines north to Canada enabled the railroad to participate in Boston-Montreal and New York City-Montreal passenger service. The Rutland hauled trains of milk bound for Boston and New York City from Vermont. In conjunction with the Ogdensburg Transportation Company, a steam navigation line on the Great Lakes, the Rutland offered through freight service to Chicago, Detroit, and other Great Lakes ports. Busy and reasonably profitable, the Vermont line again attracted the interest of other railroads. Shortly after the turn of the century, the New York Central and Hudson River Railroad (predecessor of the NYC) began to buy Rutland stock. William Seward Webb, son-in-law of Central President William H. Vanderbilt, also bought stock becoming president of the Rutland on May 1, 1902. By 1904, NYC interests owned more than half of the capital stock of the railroad. In 1905, the NYC acquired full control of the Rutland, and the Vermont line entered a period of NYC operation and prosperity. Industrial products moved west and north on the Rutland, while grain from the Great Plains was transported by ship to the rails in Ogdensburg for movement eastward.16 By 1913, the Rutland showed a very substantial increase in the freight and passenger density, and train loading was better than in any previous year during the past decade.17 It was during this period that the Rutland acquired additional rolling stock, including its first and only all steel baggage cars. These new cars fol! lowed NYC specifications. This period of prosperity was short-lived for the Rutland. The New York, New Haven and Hartford Railroad (NY, NH&H), a major competitor of the NYC, attempted to acquire majority interest in the Rutland. While they were unable to accomplish this, they succeeded in reducing the NYC's influence over the line. During the battle for control of the Rutland, the Interstate Commerce Commission (ICC) in 1915, in accordance with the Panama Canal Act determined that the Rutland's Great Lakes shipping line was in illegal competition with the NYC. The steamship line had served as a valuable feeder for grain and other shipments from the west to New England. The commission ruled this ship traffic constituted illegal internal competition between NYC and its subsidiary line, the Rutland. The Rutland continued under NYC control until 1941, when it once again became an independent railroad. Without access to the Great Lakes as a transportation route, and the lack of industrial development in the area it served, the Rutland struggled to survive. A major flood in 1927, damaging much of the railroad's physical plant and the Great Depression served to further undermine the line. The company nearly went bankrupt in 1938 and survived only at the intercession of the federal government and a local "Save the Rutland" movement. The Rutland operated throughout the 1940s. It lacked stability and was not in good economic shape, even with the increased traffic caused by the Second World War. Ultimately the Rutland Railroad reorganized as the Rutland Railway Company. The new company came into existence on November 1, 1950. The Rutland Railway Company attempted to make itself a streamlined organization. It scrapped older freight cars and little used lines and used the money to buy modern freight cars, upgrade its other lines and purchase diesel locomotives. The complete dieselization of the Rutland occurred in 1953. The Rutland discontinued passenger service in 1953 as well, further reducing operating costs of the line. Increased traffic from 1955 to 1958 on the Ogdensburg Division line, due to construction of the St. Lawrence Seaway, also helped. In spite of the improvements of the late 1950s, the Rutland could not overcome its labor problems. Throughout most of the twentieth century, Rutland employees were paid less than the industry average. In late September 1960 the employees walked out. Despite federal involvement, no solution could be ironed out and it applied for abandonment in 1963. The state of Vermont purchased part of the old Rutland, rolling stock included, and leased it to the Vermont Railway Corporation and the GMRC. F. Nelson Blount, a self-made millionaire, owned the Blount Seafood Corporation. His interest in railroads, in particular steam locomotives, lead to his purchase of the tourist oriented, narrow gauge, Edaville Railroad in 1955. It was as president of this railroad that he began amassing standard gauge locomotives and rolling stock. His collection moved to North Walpole, NH, and ultimately to Bellows Falls, VT. It was during the early 1960s at Bellows Falls that Blount set up the Steamtown Foundation (also known as Steamtown USA) and the GMRC. Steamtown USA, a non-profit foundation, managed his collection and ran steam excursions, while the GMRC provided local freight service. Blount died in an airplane accident in August of 1967, but the Steamtown Foundation continued as caretaker of his collection. The GMRC severed its ties with Steamtown USA after the death of Blount. Without the patronage of Nelson Blount, Steamtown USA had a number of financial problems. A decision was made to move to an area with greater population density to provide a larger visitor base. Steamtown USA relocated to Scranton, PA in 1984 and 1985. The relocation to Pennsylvania did not provide the hoped for financial stability. Pennsylvania Congressman Joseph M. McDade, realizing Steamtown USA was on the brink of bankruptcy, proposed establishing a National Park Service unit to manage its collection. This idea came to fruition with the passage of the Omnibus Act of 1986, which included provisions for the creation of Steamtown NHS. Ultimately the Steamtown USA collection made its way into the care of the NPS in 1989 (See Steamtown NHS Accession STEA-00002). GENERAL BAGGAGE CAR INFORMATION: The #129 was originally built as a baggage car (A.A.R. Designation: BA). By definition, it is a car constructed and equipped to render it suitable for passenger train service having wide side doors for the admittance of baggage with or without windows or end doors. Generally on a passenger train of the steam era, the baggage car was coupled between the locomotive tender and the rest of the consist. This allowed for a buffer space between the locomotive and travelers. The #129 was one of three baggage cars, numbered #128 through #130, ordered from ACF by the Rutland in 1914 as Lot #7442. It followed NYC Plan G-74. 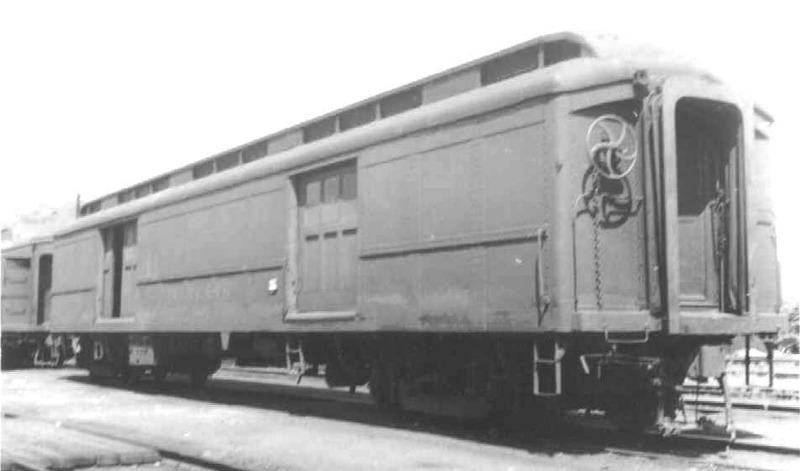 The #129 is not identical to other NYC-style baggage cars and had some unique characteristics including wood baggage doors and exterior accessed toolboxes. The three baggage cars purchased by the Rutland, provided service on the Green Mountain Flyer (Trains 64 and 65) and Mount Royal (Trains 50 and 51). These were the primary passenger trains for the Rutland, running from Montreal to New York City. The #128, #129 and #130 traveled this route until 1953. The #129 traveled the rails between Montreal and New York City until 1953. In 1953 the Rutland ceased passenger service. The #129 saw Railway Express Service on freight trains from 1953 to 1960, transporting packages and smaller boxes much like Federal Express and UPS does today. Railway Express Service ceased on the Rutland in 1960. Without baggage to haul, the #129 was converted as a Tool Car for use in train wreck service in 1961. As a Maintenance of Way (MOW) car, it was assigned the number X627. The 'X' in the number designates all MOW cars. It was in MOW service when the Rutland abandoned its lines due to an ongoing strike. The Green Mountain acquired the baggage car from the now defunct Rutland Railway Corporation on March 14, 1965 at the cost of $850. It was renumbered as X603, for MOW purposes. It served very little time, if any, as a MOW tool car for the GMRC. In 1967, at the direction of Nelson Blount, the car was used to display a model train of a circus. After the death of Blount, Steamtown USA and the GMRC became distinct separate entities. Cars with revenue service potential were retained by the GMRC, while steam locomotives, excursion cars, museum pieces and display cars made it into the hands of Steamtown USA. On April 20, 1970, the GMRC sold the baggage car to Steamtown USA. The relocation of Steamtown USA to Scranton, PA in 1984 and 1985 had little effect on the #129. It ceased at some point being used as a display car containing public exhibits during the Steamtown USA period. It was reportedly empty from 1989 to 1990 and is currently (May 2000) serving as storage for various seats and cushions from passenger cars. PREVIOUS MODIFICATIONS: Unlike most of their NYC counterparts, the Rutland baggage cars had wood, recessed-panel baggage doors rather than plate steel doors. The #129 is unique among the Rutland cars in that it had a three windows in its six-foot wide door, as opposed to the four window doors of the #128, #130 and most NYC G-74 style cars. In addition to the wood doors, the Rutland made a minor modification to the new cars shortly after being received from ACF. It added an under-slung steel toolbox. These three cars are the only all steel baggage cars ever owned by the Rutland. Purchased during the highpoint of NYC influence, they closely followed plan G-74 for a standard baggage car. Over 640 cars followed these plans for the NYC and associated lines between 1912 and 1929. The builder's paint job closely followed NYC Standards as well. The roof and underframe painted black. The main body of the coach and clerestory window frames painted Pullman Green and simple lettering done in gold leaf. "RUTLAND" extended across the letter board between the two baggage doors in elongated Railroad Roman. Also in Railroad Roman, appeared the car's number, centered between the doors and either end of the car, and below the beltline. This general style can be seen in photographs of other NYC and NYC associated lines, and is apparent in the builder's photograph for Rutland Baggage Car No. 130. During the 1930s, the Rutland modified its cosmetic appearance, reissuing lettering specifications for a number of its cars. This was probably done in conjunction of the NYC changing its lettering. Rutland Drawing No. R90787A, revised November 8, 1932, shows a centered car number as opposed to being on either end. All three cars were sandblasted during 1930, and received new coats of paint (#40 Flat Amerol Var.) in 1932, most likely in the new appearance. Except for the relocation of the car number, all other specifications remained the same. This drawing provides considerable information on the initial appearance of the #129. The letter board remains filled between the baggage doors. Size and spacing of the six-inch gold leaf letters are provided. The formations of the letters are well defined in the drawing. The actual lettering might be a little off, since the letter board is 21'-9", and the drawing allows for an area slightly over 22 feet. This lettering under various coats of paint probably served as a template for the current "RUTLAND" on the car. The car number is the major modification from the factory paint job. It specifies the location to be centered under "RUTLAND" and 16-1/2" from the bottom in six-inch gold leaf numbers. This number is still discernable under the paint on one side of the car. This should be documented before any paint removed in this area. It might provide useful information on style when reproducing the letters. The Notes for Drawing R90787A also indicate a couple important pieces of information. Note #1 indicates the following message is to be centered on the end doors three feet above the bottom of the door, "PASSENGERS NOT ALLOWED TO STAND ON PLATFORM." While size is not indicated, they are probably one inch. Note #2 indicates numbering to be on the door on either end, in either 2 inch or 2-1/2 inch numerals, depending on the location of the car discharge valve. Note #3 indicates all exterior lettering to be done in gold leaf. If these directions were followed, some remnants of the gold leaf used in the 1932 painting and renumbering might remain. In addition to general appearance, the passenger car maintenance record for the car, which covers a period from 1930 through 1938, indicates other work done on the car. The interior was repainted in 1935, as well as the roof, deck, trucks and floor. During the same period, the doors were repaired, and the electrical system overhauled. The wheels were also replaced and the trucks repaired. In September of 1936, the car maintenance card indicates the #129 received lettering in imitation gold paint. At this time the NYC was also shifting to imitation gold paint, commonly known as Dulux gold. The first cars to undergo this shift were "load carrying passenger cars" such as baggage and mail cars. References on Drawing R90787A refers to a number of NYC specifications. The numbers on the end doors have "N.Y.C. LV 13239" referred to. This sheet probably has the template for the numbers used. The sheet also has a note, "FOR EQUIPMENT INSPECTION MARKINGS USE NCR LATEST STANDARD, FOR GAS TANK MARKING SEE NYC-T-7040." The trucks also have a note specifying lettering for a four-wheeled truck to use markings use N.Y.C. LV 13232, and a six-wheeled truck to use N.Y.C. LV 13230. All these notations indicate the Rutland was still under the influence of the NYC. The number location change on the Rutland baggage cars do not represent a shift from NYC standards, it indicates an attempt to continue conforming with their standards. NYC baggage cars shifted the number location as well. At some point during the late 1930s or early 1940s, the Rutland reduced the size of its name on the letter board. This could have happened when the lettering was redone in 1936 with dulux gold, or possibly later. The outline of the shortened version is visible on the #129. If an analysis is made, it might be able to determine if this was dulux. If the lengthened version has remnants of gold leaf, that would indicate the 1936 paint job resulted in the shortened format. During the early 1940s, yet another relettering of the car was done. Since the NYC totally divested itself of its interest in the Rutland, it no longer had any influence on the railroad. About this time, another New England based railroad, the Boston & Maine (B&M) changed its lettering from up on the letter board to below the belt rail. The color of the lettering shifted from dulux gold to aluminum. The Rutland seemed to follow this trend as cars were repainted. Some images of other Rutland rolling stock indicates a trend away from Railroad Roman, towards a sans serif style font, similar to Gothic. Images of the #129 indicate it continued to use Railroad Roman. The simplified appearance of the car lasted through its service as baggage car. When baggage express service ceased in 1960, it appears the old car number was blotted out with spray paint, and the MOW number, "X627" was added below the number. It is unlikely if it worked much as a wreck train tool car due to the continued decline of the Rutland in its last years. With the demise of the Rutland, new railroad companies acquired its rolling stock and some of its lines. The Green Mountain purchased the #129 (now the X627) in June of 1965 and renumbered it GMRC #603. It is unknown if this car ever carried this number, but it was listed on the GMRC Roster as a tool car until 1969. At the time of its purchase, F. Nelson Blount controlled the GMRC and Steamtown USA. During the 1960s rolling stock was often shared between the two organizations. While listed as a Tool Car in the GMRC's 1969, the #129 received a new roof, got a coat of red primer and light olive green paint, and was relettered in a semblance of its original factory appearance. White paint was used instead of gold leaf, the car number was not centered, but overlapped the nearest rivet row to the door. RUTLAND again extended the full length of the letterboard. In addition to these attempts to represent its original appearance, two parallel white lines, or piping, extend along the length of one side of the car. One line is at the bottom and a second line follows the mid-beltline of rivets. The new appearance of the car was to be as an exhibit car for a model circus train set at Steamtown USA. The GMRC's records refer to the car as the "Baggage (Circus) Car" and that it was moved to Steamtown in 1966 per Blount's instructions. In 1969, the #129 was sold to Steamtown USA by the GMRC as the two organizations separated themselves. Steamtown USA maintained the car as an exhibit car, but made no further modifications to it. While in the care of the NPS, no modifications have been made. After 1991 it became a storage area for passenger car seats. 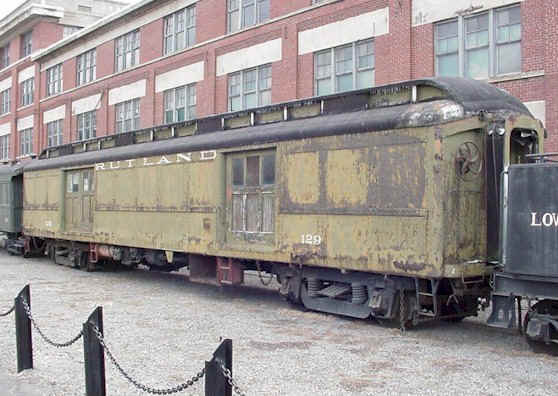 FINAL COMMENTS: The Rutland Baggage Car #129 is an example of a baggage car of all-steel construction. It spent nearly forty years operating as a baggage car between Montreal and New York City for the Rutland Railroad. The design of the car was pretty much standard for many lines in the Northeast and the Midwest. Its as-built appearance from the ACF plant in Berwick represents the local history of this Vermont-based car. If Steamtown NHS determines to retain this car in the collection it should be on the merit of its long service as a typical baggage car of a design that was used on nearly a thousand similar cars. Its use during the steam era and the ACF/Berwick construction places it in a broader historical context. While the car's Rutland service is interesting, interpreting that line does not fall within Steamtown's interpretive scope. Currently Steamtown does not have any baggage cars, of wood or steel construction, in exhibit condition. While two Delaware, Lackawanna & Western Railroad (DL&W) baggage cars, the #2065 and #2067, exist in the collection, they are currently stored at Tobyhanna. While these two cars should be preserved as well, the #129 is an older car (by fourteen years) and has a documented steam era appearance. The #129 is unique in the Steamtown NHS collection in that it has clerestory windows of an earlier era, the DL&W baggage cars do not. If the wood-lined interior of the #129 is ever restored it would provide the opportunity to interpret the function of a baggage car during the steam era. If appropriate travelling luggage, crates, baggage forms and animal containers might be found, it might serve to further interpret the steam era passenger experience. FUTURE RESEARCH: The subject on baggage cars in general and this particular car could certainly be expanded. While NYC standards have been referred to throughout this paper, no copies of the NYC G-74 plan for baggage cars or NYC lettering specifications noted in the 1932 Rutland lettering drawing have been located. The story of the people who worked on this type of car and the type of work they did has been overlooked. For this car, a check of the ACF archives stored at the Mercantile Library and the ACF drawing collection at the Museum of Transportation in St. Louis turned up nothing. A search on this type of car for similar NYC and affiliated lines baggage cars was not made due to time constraints. A search for additional ACF archives might also be helpful. Comparing this car and other G-74 type baggage cars might provide additional information. Documentation of the Rutland Baggage Car #130, currently owned by GLF in Moira, NY (a feed store) and used for storage could provide more information. A search for all remaining G-74 type cars might also put the significance of this car in the appropriate context. Nearly 640 cars of this class were built. ACKNOWLEDGEMENTS: The author would like to take this opportunity to thank those members of the Rutland Railroad Historical Society who have provided much needed information and input on this report. A special thanks to Bruce Curry for publishing the initial inquiry for information in the Fall 1999 publication of their newsletter, The Newsliner. Thanks to Jim Dufour, Bill Badger, Steve Mumley and Michael K. Sparks for their outpouring of information. While there are still a few gray areas in the history of this piece of equipment, they were instrumental in tying together many of the loose ends that existed regarding this car. Additional thanks go to NPS historians Gordon Chappell and Mark Morgan. They provided much of the groundwork for this report, Chappell in quantifying existing information on the car, and Morgan for his coverage of the history of the Rutland Railroad and ACF in related reports. Finally, no reference to the Rutland can be complete without mentioning the two major works regarding the Rutland, R.W. Nimke's book, The Rutland: 60 Years of Trying, and Jim Shaughnessy's book, The Rutland Road. Rutland Steel Baggage Car No. 129 is seen at Rutland, Vermont in June of 1959. The car is now in the Steamtown collection at Scranton, PA.